The photographer’s tent at Port Arthur: 1872 or 1874? Professional photographers Alfred Bock, Samuel Clifford and Thomas Nevin visited the prison at Port Arthur on the Tasman Peninsula on several occasions between 1866 and 1874. Bock photographed the prison’s officers, Clifford photographed visiting dignitaries and the scenery, and Nevin photographed day-trippers, buildings and the handful of prisoners still located there between 1872-74 before they were transferred back to the city prison in Hobart. The bulk of the extant 300+ police photographs in public collections of prisoners taken in the 1870s he took at the Hobart Gaol and Mayor’s Court, Hobart Town Hall. At Port Arthur, these three photographers Alfred Bock, Samuel Clifford and Thomas Nevin made use of makeshift arrangements in the Officers’ Library and the Police Court washroom. On day trips they used a photographer’s tent. Locally-born A.H. Boyd (1829-1891) was an accountant at the Port Arthur prison in 1853, superintendent of the Queen’s Orphan School (July 1862-October 1864) where he was dismissed for misogyny, a stipendiary magistrate at Huon (1866-1870), and Civil Commandant of Port Arthur (June 1871-December 1873), a position he was forced to resign because of allegations of corruption and nepotism implicating his brother-in-law, Attorney-General W. R. Giblin. He was not a photographer by any definition. A. H. Boyd had no reputation during his life time as a photographer, and no photographic work exists by A. H. Boyd. His “amateur photographer” status originated as a rumour spread by descendants, which was published as “likely” by an uniformed and gullible Chris Long (1985, 1995) from the singular circumstance of Boyd’s presence at the Port Arthur site in 1873, a date which only approximates the date “1874” written on the verso of several extant convict cartes (Davies & Stanbury, 1985; Kerr & Stilwell, 1992; Long, 1995; Reeder, 1995). Their assumption was that a cargo of photographic plates sent to Port Arthur in July 1873 was used by Boyd to take photographs of the prisoners there; research, however, has shown the plates were accompanied by T. J. Nevin’s partner Samuel Clifford and used to photograph the site’s buildings, visiting dignitaries, and the surrounding landscape (Tasmanian Papers Mitchell Library Ref: 320). It was assumed that the wet plate process was used by the photographer at Port Arthur, but Clifford was known for his proficiency in dry plate photography (Kerr, 1992). It was also assumed that other photographic equipment returned to Hobart in April 1874 – a tent and stand – was Boyd’s personal property, but the only property that was listed as Boyd’s were “1 child’s carriage, 1 package Deer Horns, 1 Hat Box, Leather, 1 package of Buttons [? ]” accompanied by his wife who was a passenger. Because these assumptions were published as a “belief” in the A-Z reference, Tasmanian Photographers 18401-940: A Directory (1995: TMAG, Gillian Winter ed), several publishers and curators in the past decade have mistaken the “belief” about Boyd to be an attribution as photographer of convicts. The surviving photographs of Tasmanian convicts in public holdings from the 1870s to the early 1880s were taken by the commercial photographer Thomas J. Nevin at the Hobart Gaol on contract to the Lands and Survey Dept and Municipal Police Office of the Hobart City Council and Hobart Gaol. Contrary to these postulations by apologists promoting the prison’s Commandant Adolarious Humphrey Boyd as the photographer of the extant 300+ police mugshots of prisoners taken in the 1870s (eg. Julia Clark 2010 and Warwick Reeder 1995, citing Chris Long 1995 after Edith Hall 1930), there was no “dark room” at Port Arthur specifically designated for the photographing of prisoners. If the same apologists wish to claim that Boyd possessed the photographic tent and headstand which were returned from Port Arthur to Hobart on the government schooner, the Harriet, on 2nd April 1874, listed on the way bill as goods destined for government stores, (Tasmanian Papers 320, Mitchell Library SLNSW), then Boyd had no building housing a “dark room”. Those items could not have belonged to A. H. Boyd, because he would have had no need of a tent: according to his apologists, he had this so-called “dark room” in the garden, the “existence” of which they say is proof enough he photographed prisoners. Yet A. H. Boyd had no reputation as a photographer in his own life-time. No photographs ostensibly taken by him have ever surfaced, none have been profferred by either his descendants or their apologists who have rushed into print, and no document testifies to his training, skills, or official mandate. The “belief” in A. H. Boyd from these apologists is simply tourism spin originating from the Port Arthur Historic site and maintained there to this day to justify the fish-bowl furphy of Port Arthur as a model of insular self-sufficiency. The name of A. H. Boyd appears twice on the schooner Harriet’s way bill list dated 2nd April 1874, four months after Boyd was forced to resign under allegations of corruption and replaced by Dr Coverdale as Commandant of Port Arthur. His name appears against cargo designated as “private”, some of which is identified by the owner’s name, eg. “1 Umbrella … Mr G. B. Walker”. The photograph stand and tent are NOT identified by the owner’s name. The second appearance of Boyd’s name specifically brackets four items which included “1 child’s carriage, 1 package Deer Horns, 1 Hat Box, Leather, 1 package of Buttons [?]”. These FOUR items were bracketed as Boyd’s personal property, but the photograph stand and tent DO NOT appear here. Therefore, the stand and tent cannot said to be Boyd’s personal property: to argue for attribution to Boyd as the photographer of Tasmanian prisoners, reduxed as “convicts” by the tourism industry, on the basis of unproven ownership of two pieces of photographic equipment, demonstrates the absurdity of such a claim. A cursory glance at the Tasmanian Names Index (AOT) shows hundreds of Boyds alive in Tasmania in the 1870s, and not one of those Boyds has ever been documented as a photographer in their own lifetime or subsequently. Even A.H. Boyd’s predecessor in the position of Commandant at Port Arthur, another but unrelated Boyd, James Boyd, who was the owner of stereoscopic equipment auctioned from his house in Battery Point in 1873, has never been documented as either an amateur or skilled professional photographer. The Port Arthur prison was well and truly closed by 1877. It was not until the tourist boom of the 1890s-1910s,when the prison was little more than a desolate ruin, renamed Carnavon and heavily promoted to intercolonial visitors as central to Tasmania’s history, that a “dark room” mentioned in Edith Hall’s children’s story The Young Explorer might have existed in reality. Edith Hall (nee Giblin) claimed to be the niece of A. H. Boyd who visited him at Port Arthur while he was Commandant (1871-83), and her “story” – although generically fiction – has been interpreted as documentary proof of Boyd taking photographs of prisoners. In all probability, Edith Hall saw a copy of this stereograph of the Government cottage with the little girl (below), and gazing upon it among the dozens taken at Port Arthur by Bock, Clifford and Nevin held in the Tasmanian State Archives, took up her pen and wrote a story for children in the 1930s to give them a happier version of old Port Arthur. She may even have imagined herself as the young girl in the stereograph (below) as she gazed upon it, immersing herself with no small degree of narcissicism in the photograph’s narrative possibilities. Her story, The Young Explorer, (typescript deposited at Tas Archives 1942)written in the 1930s when she was in her sixties is indeed an imaginative children’s fiction about pretty girls in pretty frocks visiting the site. She does not identify anyone by name in the story; she fabricates a character called the Chief who was always “on the lookout for sitters.” Her description of a room where the child protagonist, the young explorer, was photographed (and rewarded for it) hardly accords with a set-up for police photography. The photographing of prisoners is not mentioned in either the story or the accompanying letter forwarded to the Archives. In the context of the whole story, only three pages in length, the reference to photography is just another in a long list of fictions (many about clothes and servants) intended to situate the child reader in a place where the convict stain so central to the legacy of Port Arthur has been cleansed. Edith Hall’s story is a composite of general details that concord more with the imagery in the postcards sold by Albert Sergeant in the late 1880s, and Port Arthur as the premium tourist destination of the 1920s, than with the site during its operation in 1873. In short, it is a piece of historical FICTION. Photographers producing postcards and mementos of Tasmania’s penal heritage might have had at their disposal a “dark room” at Port Arthur in the last decade of the 19th century, but in the late 1860s and early 1870s, photographers at the site made do with makeshift studios and what they could transport with them by schooner. 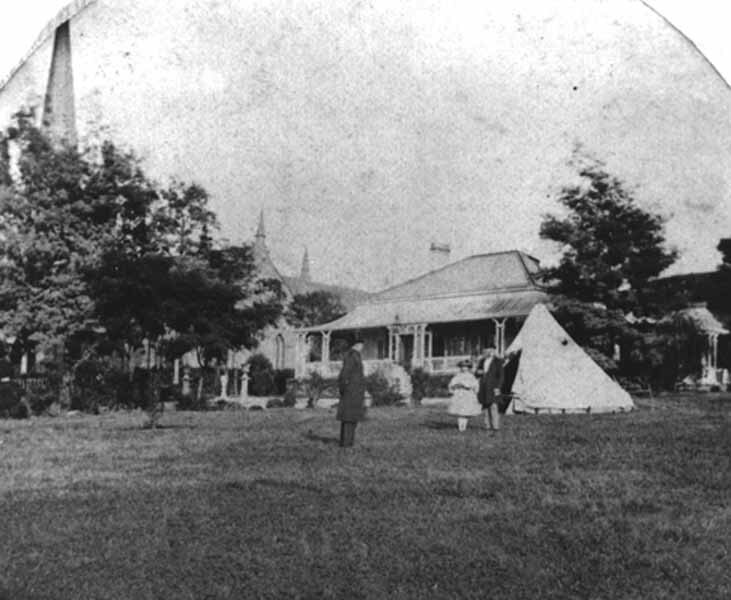 This stereograph (below) of a tent pitched on the lawn in front of the Government Cottage, with one gentleman in a top hat standing at a short distance, facing a young girl and another gentleman in a top hat outside the tent’s entrance, bears traces of multiple printings in different formats. The darkened round corners of the print suggest it was printed first in a double oval or binocular stereoscopic mount, and reprinted with squared corners. The dress fashion of the men and girl suggests day trippers in their Sunday best rather than the work-a-day dress of prison officials or local employees. 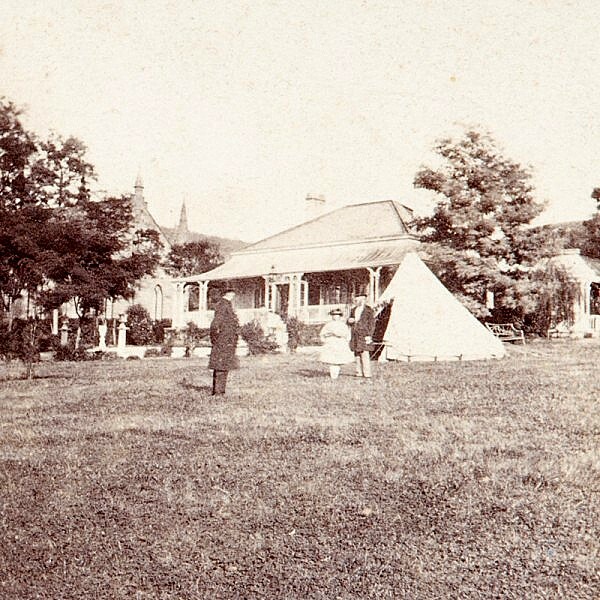 If Nevin had taken this photograph in early 1874, the tent listed on the government schooner’s way bill definitely belonged to him, because he was away at Port Arthur and not in Hobart when the birth of his son Thomas James Nevin jnr in April 1874 was registered by his father-in-law Captain James Day, the only birth registration of his children he did not personally sign.If the photograph was taken in April 1874, the man standing next to the girl could be identified as G.B. Walker, brother of historian James Backhouse Walker (1821-1899), who appears on the way bill of 2nd April 1874 as a passenger, accompanied by his cargo of one umbrella. The girl could then be identified as G. B Walker’s daughter, and the man facing them, possibly Dr John Coverdale, by then incumbent of the Cottage behind them. However, if Nevin photographed this group two years earlier, on 1st February 1872, the more likely date, the girl and bearded man standing in front of the tent could be identified as Jean Porthouse Graves, the man as barrister Byron Miller (her future father-in-law), and the clean-shaven man facing them, solicitor John Woodcock Graves, Jean’s father. This stereograph is currently held at the antiquarian booksellers, Douglas Stewart Fine Books, who also held Jean Porthouse Graves’ family album containing several Nevin stereographs, now part of the KLW NFC Imprint collection. The verso of this stereograph bears no studio stamp. The inscription “Government Cottage Port Arthur Tasmania” was possibly written by a contemporary of the photographer, either the purchaser or subsequently by a collector. If it was sourced from the personal or family collections of Edith Hall, or any related member of the Boyd family, it would carry personal names, but it doesn’t, although something pencilled along the roof-line of the cottage appears to have been erased. To the original inscriber, the subject of this photograph was the building, and not the people or even the tent. The intended purchaser was probably an intercolonial visitor to Hobart, who needed the reminder that the photograph was taken in Tasmania. The catalogue entry for this stereograph online at Douglas Stewart Fine Books – “Government Cottage, Port Arthur, Tasmania CLIFFORD, Samuel (1827-1890) (attributed)” – highlights another problem of attribution regarding Thomas Nevin’s work. It seems that any Tasmanian stereograph of the 1870s which bears no identifying photographer stamp is assumed to be the work of Samuel Clifford, whether by state archivists, museum workers or dealers. Photographers Samuel Clifford and Thomas Nevin travelled around the island in partnership during the 1860s-1870s, producing prodigious numbers of commercial stereographs. One of their visits on passing through Bothwell was reported at length in The Mercury 26th September 1874. Many of their stereographs of identical views carry Clifford’s stamp on one, Nevin’s on the other. Dozens of Nevin’s stereographs were not stamped at all if they were printed in quantity for the Lands and Survey Dept. Some of his stereographs held at the TMAG feature the same groups of people taken on the same day in the same place, where one stereograph carries his studio stamp, and the other carries no identifier. 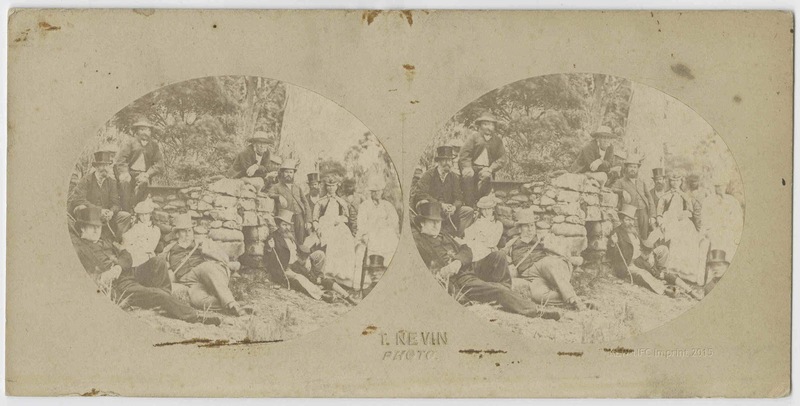 Whoever reproduced this particular stereograph of the tent at Government Cottage, Port Arthur with squared corners from the original, leaving the double oval mount visible, not only produced a less than appealing copy, they may have taken pains to disguise the original photographer’s name; one can safely assume, however, that such an amateur reprint would not have issued from Thomas J. Nevin’s studio. Source: These are scans of the copy currently displayed online at Douglas Stewart Fine Books. A black and white copy of the single image, undated and unattributed, is held at the Tasmanian Archives and Heritage Office. No-one other than Thomas J. Nevin could have taken the original of this stereograph. If he did not photograph these day-trippers at Port Arthur in April 1874, he most certainly photographed them on Thursday, 1st February 1872, when he was enjoined by the Tasmanian Attorney-General who was also his family solicitor, W. R. Giblin, to proceed to Port Arthur with local and intercolonial VIPS accompanying British author Anthony Trollope. Giblin had issued Nevin with rolling government commissions and contracts in 1868 for the Lands and Survey Dept. The negatives he used would have been prepared with the tannin dry plate process, supplied in quantity by Samuel Clifford to his cohort, so a source of continuous flowing water was not the urgent necessity it was for using wet collodion plates. The day before, on 31st January 1872, Thomas Nevin had photographed several members of the same visiting VIP group on a day-trip to Adventure Bay. He printed those dozen or so negatives in different mounts, in some instances the same negative as variously a cdv, a stereograph and a plain unmounted print according to the wishes of the trippers. This one (below) was printed in the same double oval stereograph mount as the original of the stereograph (above) featuring his tent. John Woodcock Graves, Jean Porthouse Graves and Byron Miller appear on the extreme left of each single image. Head in topper only on extreme right: Sir James Erskine Calder.